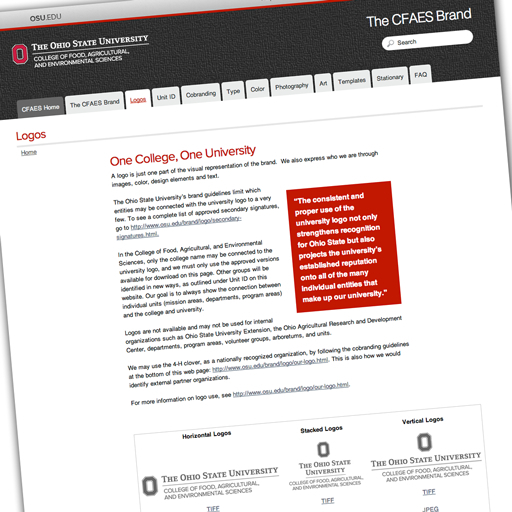 Communications and Technology has expanded online information about the new university and college brand guidelines, and has consolidated it into a website athttp://cfaes.osu.edu/brand/. This website includes templates and logos, along with information about how to use both. Templates are available for brochures, flyers, postcards, PowerPoints, and research posters. You will also find links to university brand information. Additional resources continue to be uploaded, so be sure to check the site often. The schedule for release of information and templates can be found here. If you missed earlier training sessions on the brand, two more are on the horizon. On Sept. 26, a Web-based training session will take place from 10 a.m. to noon, targeted to county personnel. Go tohttp://carmenconnect.osu.edu/cfaesbrand to participate. Another all-college training session takes place on Oct. 8 from 10 a.m. to noon at the same link as above.